StereoMan needs a little R&R, which inevitably means an extended hiking trip. The shop will be closed Thursday through Saturday, April 25, 26, and 27. When I return I promise to share some of my photos! Steve can also help you obtain good quality audio and video components at competitive prices. And for your convenience, StereoMan makes house calls throughout the region! What experience does StereoMan have? Why does Stereoman do this work? it has come to our attention that some GPS systems direct you to our across the street neighbor, RB Gas Co. We’re in the little red brick bldg in the hidden side of the curve. ^^Click the link^^ for a convenient map! StereoMan’s labor rate is a mere $48 per hour. Car stereo installation starts at $54.95. Routine maintenance and repair of stereo components typically runs in the $30 to $75 range. If it’s going to be more, you’ll get a call first! Despite having to increase his travel rate due to ever-higher prices at the pump, StereoMan’s travel charge is still a very reasonable $10 for the first 5 miles from the shop and $2.00 per mile thereafter. We now offer an expanded line of Pioneer products at prices that rival the Big Box Stores! Call or come by and see what we can do for your ride! Click Here for 2019 Pioneer Stereo Pricing! 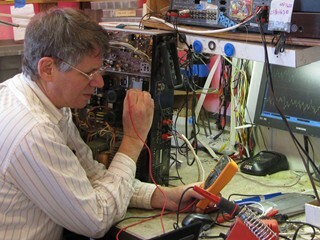 StereoMan provides in-home service and car stereo installation by appointment throughout the Asheville area. Backlog for appointments is often two weeks or more, and bench backlog is typically six weeks or more. At this time I am booked out a month on installs! Please call to schedule your car or in-home service. Car stereo walk-in’s are discouraged due to the tightness of my schedule. If you have equipment to drop off for repair, my door is open Thu, Fri, and Sat 10 a.m. to 6 p.m. Please be prepared to make a $25 deposit on all repair items, that is my minimum bench charge. For your convenience I accept all major credit cards. Yesterday I provided in home service for a blind woman. Not merely “legally blind”, but absolutely not able to see. I got her two CD players hooked up and working (she has a backup just in case), and then figured out how to turn off the wake-up alarm on the backup (she had turned it on by mistake, and when it started beeping she thought it was a smoke detector and called in the fire department!). Then I helped her identify the different buttons on the remote, which involved guiding her fingers to the right positions as I explained what each button did. When all that was done, she asked me to come in the kitchen and see if I could get her dishwasher started. To which I, of course, complied. She knew where the different buttons were located, but unable to see the indicator lights, she couldn’t tell that she had pushed one button too many and turned the wash cycle off instead of on. Then when it was time to pay, she asked me to fill out the check, and then guide her finger to where she was supposed to sign it. I charged her $46 for my travel and my time. It was close by, and less than an hour. StereoMan is still booked out more than four weeks on car stereo and six weeks on bench work. I thought I was catching up a mite, but new work keeps pouring in as fast as I can get it done. Thanks to everyone for trusting me with your home and car entertainment needs. I do my best to hook you up for a fair price! I’ve been working on Bose products for years and years, with some success despite their complete lack of support for field repair. No replacement parts, no service information, no tech support, nothing. Still, I can boast a better than 50% success rate, just knowing how to take them apart, what common problems to look for, and what replacement parts can and can’t be used to complete a repair. Due to their immense popularity – and high cost – I have at least one Bose unit in my shop at any given time. Recently a customer bringing one in for repair told me they had found out about StereoMan on the Bose website! Imagine my surprise to learn that although they are doing absolutely nothing to support my efforts, they are happy to tell people that I am out here to support their products. The irony is not lost on me, but I take it in stride. I’m here to support my customers, and if they’re willing to take a chance on me repairing their Bose stereo, I’m going to give it my best shot. Apparently my best shot is pretty good. Good enough to get mention on the Bose website. Huzzah! Today I had three service calls, one install of two new tv’s, two consults. Each of the three households had at least one canine member. The first was a huge dog, some kind of Labrador mix, quiet and friendly but not overly. She followed her master everywhere. The second was a tiny ball of fluffy fur with endless energy, she never merely walked when bounding was possible. Two dogs in the third household, one border collie-ish, the other like a smallish Samoyed. The collie greeted me at the driveway and I gave her a cookie. She carried it around in her mouth, without biting it, for several minutes, then trotted over to a nearby hedge and buried it. I love dogs and I feel like they tell me a lot about their human companions, what kind of people they are. All the dogs I met today, they all had good humans. Good people. I can’t be happy if my customer is not happy, no matter how unreasonable his request(s) may be. So if a customer orders a $500 stereo and then after I order the radio changes his mind and wants a different model so he can have Apple Car Play, what the heck? I’ll sell that first radio to someone else at some point, right? Get the customer what he wants! And, of course, if anything happens to my customer’s car while it’s in my shop, I must take responsibility for it. After installing thousands of car stereos over two decades, first time ever the customer’s dashboard cracks when I’m taking out the factory stereo. What can I do? I have to pay to have the dash replaced. It’s mighty expensive, but it’s a no brainer. I have to do it. But oh boy was the customer pissed! So the dash work done and paid for, it’s time to put the radio in, and I get it all done, it looks great, works just like it should, but the customer isn’t at all happy about having to plug his phone into the USB in order to use Car Play. He’s mad at me for not telling him that. We discussed it all in advance! he insists. I don’t recall that, but it doesn’t matter, I show him online that there is only one radio available right now that does Car Play wirelessly, and it’s not a Pioneer. I offer to install it for him if he wants to buy it, and take back the one he ordered. But he’s so pissed at this point he doesn’t want me to do anything for him. The job ended up costing me about half what I make in an entire month, but I would come out of it satisfied if my customer came out of it a happy customer. But he didn’t. So I didn’t either. Update: Pioneer now offers wireless Apple Car Play and Android Auto. Not that it would have made any difference in this case.